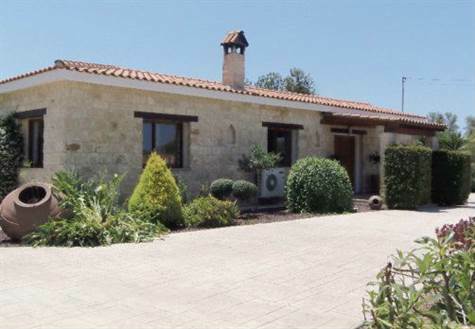 Polemi, Paphos - This outstanding detached resale property is located in a quiet unspoilt area of Polemi village, which is just 25 minutes from Paphos town and 20 minutes from Polis and Latchi. Surrounded by vineyards and not overlooked, this spacious home offers everything that is required for that perfect life in the sun. The house has three double bedrooms, the master bedroom is en-suite and all have fitted wardrobes and air conditioning. There is a good size family bathroom with bath and over head shower. The very large lounge has air conditioning for the hot summer months and an open stone fire place for the cooler winter months. The property also has full central heating in all rooms, powered by a diesel boiler located outside the house. The fully fitted kitchen comes with a built in eye level grill, oven and hob. Leading from the kitchen is a good size dining room with views over the garden and pool. The outside area has an 8x4 metre swimming pool. The property has large mature gardens, with lawn area around the pool, there are several places for outdoor dining including a 40 square metre area of decking. There is also a stone clad traditional looking BBQ. The back garden has been designed with outdoor living in mind with several areas for relaxing, entertaining and eating. The courtyard area is cool and shady in the late afternoon and is near the BBQ so ideal for entertaining. The raised decking area is also ideal for entertaining, with ample space for comfortable seating. The garden also has several fruit trees including pomegranate, orange, fig and peach with mature grape vines growing over the pergola which offers afternoon shade, making it an idea place to relax with a good book and glass of wine. Behind the lawned area are a few palms giving a great Mediterranean feel. The garden is enclosed with wooden fencing and is very private. At the rear of the house are three small vegetable plots. The growing season here is very long and we have an almost year round supply of most vegetables including tomatoes, , cabbage, peppers, chillies, sweet corn, Cyprus potatoes, salad leaves, well almost anything you can think of. There are also raspberries and blackberries growing in this area. Also in this area is a 2.8 metre satellite dish enabling Sky to be received if required, and a wooden shed for storage. In the front garden are topiary trees, olive trees and both Mediterranean and European plants. Both gardens are on full irrigation with timers. The home has full title deeds and is ideal for a holiday home or permanent residence.